Guru -Being Guru's day just wanted to share with you all. Once, an young daughter had gone to her village home for the first time from her city-dwelling. At night before retiring to bed, her mother opened a pot in which there was good cow's milk and poured a little buttermilk. The girl asked her mother: "Mother, that was butter milk; and why have you mixed it with milk? The milk may get spoiled!" "Child! ", answered the mother, "that is the way to prepare the milk in order that we might get butter out of it." "But where is butter in it, mother?" "It is in every drop of the milk, dear; but you can't see it now. I will show you in the morning." In the morning the daughter saw that what was liquid the night before had become solid overnight. Mother put a churning rod into it and started churning the curd vigorously. Butter began to float on the surface of the curd. Then she gathered it all up and presented it to the astonishment of the daughter. The mother explained: "The addition of the buttermilk curdles the milk. Milk is transformed into curd. Then you have to churn it. By this process the butter which was all-pervasively hidden in the milk is obtained. At first you were not able to see it; it was hidden. From where has it come now? Only from the milk. Therefore, you understand now that it was there all the time. It awaited the process of churning to reveal itself to your great joy." The daughter, too, followed the same process and got the butter, for herself. Similarly, a worldly man approaches a Mahatma and asks him: "O Sadhu, why have you renounced the world, and poured this new element of 'Vairagya' and 'Tyaga' into your life? Why don't you let the life take its natural course?" The Sadhu replies: "Brother, I do so in order to realise God? ", "Where is God? ", "He is all-pervading." The worldly man does not see and is not convinced. The Sadhu then explains how the inner personality, which is fickle and outflowing should be made solid and firm. Then the churning rod of one-pointed concentration and meditation should be taken hold of, and this solid 'Antahkarana' should be very well churned. Then God is realised. He is all-pervading, in every atom of creation. But He is not visible to the naked eye nor is He realisable by a man except through this process called 'Sadhana'. Just as a mother was necessary for her daughter to learn that butter exists in milk and that churning will bring it out, even so a Guru is necessary for a man to know that God is, that He is all-pervading, and that He is attained through Sadhana. If the aspirant follows the Guru's instructions, he too, can realise God. Thanks Dear Hemadpanth of this mandir, for sharing this valuable thing with us. THE JOURNEY TO THE GURU, FINDING THE GURU; AND ALSO THE JOURNEY ONCE YOU'VE FOUND THE GURU, TRAVELING WITH HIM. They are two steps of the same process -- going to the Guru and then being with the Guru. Going to the Guru is far more difficult than the second step. The first step is always more difficult, because going to the Guru means leaving your ego, leaving your mind, leaving your expectations, putting everything aside, traveling very light, with no load, no burden. All those things you have cherished all your life -- maybe for many lives -- and to detach yourself from them is difficult. And who knows? For whom are you leaving all your cherished things? You are risking for an unknown person. So the first step is difficult -- more difficult if you are going to the Guru with intellectual conviction, less difficult if you are going with a heart full of love. The heart can do miracles. It can see where mind is blind, it can understand where mind fails. It has its own way of reaching to the mysteries of life. If you are going as if you have fallen in love, then you can leave everything. Just by the way, all over the world, whenever a girl marries she has to go to her husband's house. Strange -- nowhere have they tried the other way, that the husband goes to the wife's house. But there is a tremendous wisdom in it -- because man thinks from the intellect. He may not be able to leave behind his family, his father, his mother, his brothers. But the woman loves from the heart. She can leave the father, she can leave the mother; she can leave everything of the past and go into the unknown with the man she loves. So this is a folk wisdom prevalent all over the world. Logically the conclusion would have been different. Because man is stronger, he should leave his family and go to the girl's family -- she is more delicate. But no, that has not been done. The same is true when you go to the Guru. If it is a heart-to-heart connection, you can leave everything aside, and even the first step becomes light, easy. Otherwise it is difficult, it takes time. For the intellectually converted person it sometimes takes years. He may hang around, think again and again, go a little further and come back. The second step is not difficult. Once you have reached the Guru, for both -- those who have come from the mind and those who have come from the heart -- for both the second step is easy. The first step you were taking alone; the second step you are not alone, the Guru is already with you. In fact the second step is being taken by the Guru -- he simply gives you the appearance that you are taking it. To be with the Guru is in fact something totally different. The Guru is with you, and only when the Guru is with you, is there revolution. Just your being with the Guru will not do anything. There are many people who think they are with the Guru, and nothing happens to them -- for the simple reason that the Guru is not with them; they are not yet ready. But the last thing again to be reminded of: if a person has come to the Guru with love being the first thing and logic the second thing, he will find that to be with the Guru is absolutely easy. And the Guru will find that to accept the person to his innermost being is without any difficulty. But the person who has come with logic -- the Guru has to wait. He has to see whether he drops his logic and remains with love; then only can he be taken with the Guru on the journey. Otherwise he can back out from any point, and the whole work and the whole effort would have gone down the drain. And no Guru wants to waste his time, his work, his energy. 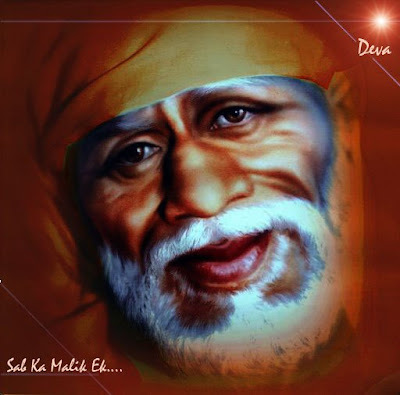 OMSAIRAM!OUR DEAREST HEMADPANT.........I HAD ATTENDED A SATSANG FEW WEEKS BACK AND THIS STORY WAS TOLD...........AMAZING HOW WE BOTH GET CONNECTED..........SAI BABA YOU ARE GREAT AND SO ARE YOUR LEELAS. THANKYOU SUBHADRA DEAR FOR REFRESHING MY MEMORY . This is indeed an interesting topic and members seem to agree that love is more important than reason. The question is does love not create blindness through attachment? In the Mahabharat we see King Dritarashtra taking unrighteous actions because his all consuming love for his son Duryodhan blinds him to the truth. Is it not a truism that love is blind? We see Shri Krishna uninfluenced by emotion so action takes place based on truth.The power to reason with the divine pure intellect is an act of leadership resulting in righteous action. Arjuna falters on the battlefield because he is overcome with love and compassion for his brothers and sisters. Yet Shri Krishna removes his doubts with knowledge.He speaks truth. It does not seem right to assume that reason and love are mutually exclusive. Love on its own is surely blind, reason on its own is surely dry and unfeeling. Truth lifts the veils of illusion does it not? We have the gift of the divine intellect, the ability to reason.Is it really wise to dismiss the gift of the divine intellect, is it wise to assume the power of reason is of lesser importance than love? If love is our motivation, we'll see that everything else falls into place -- and it becomes an even ever greater joy to use the divine gift of reason. It is good to share some spiritual thoughts once again. A duality-free view of life is of course a view that will bring happiness.Our perspectives are not quite in tune here though in the meaning of duality. By duality we mean where brothers and sisters, children of God are following the different directions of many heads, the many different heads of the many different religions. Oneness is where there is one Father and none other, one religion, one way of thinking,one direction.This is the Father who is the Teacher and Satguru, the Father of all the religious fathers. How can he be recognised? He can be recognised by the depth of the knowledge he speaks. "if a person has come to the Guru with love being the first thing and logic the second thing, he will find that to be with the Guru is absolutely easy"
The question I ask is, what exactly is it that the person loves when he comes to such a Guru, is it the message or the messenger? The message of love has been given throughout the ages, yet the world still sinks deeper into degredation, irreligiousness and unrighteousness. Gurus leave their bodies, become glorified and the world still sinks deeper into degradation. The world is in a perilous state, so these questions are of paramount importance to all of us. These questions are asked seriously and of course with respect for your chosen path. Dear respected Brothers and Sisters and Mata shree. This is the First and Foremost Little Message about Love I could learn from MY MATA, MY PITA and MY SADGURU AND MY ALL -MY SAI BABA. Prem means love and morari is one of the names of the god, Krishna. It means god, god of love. And to me the god of love is the only god. In fact love itself is the only god -- all else is ritual. Love is the only true religion; and if you can love, you start growing. You can forget God, you can forget the church, you can forget the temple; you can forget everything. If love remains, then everything is there and will grow in its own time. But if you forget love, all the temples and all the churches and all the bibles and all the vedas are not going to do anything whatsoever. So love is the essential religion. If you can become more and more loving, that is your prayer. And love does not need any preparation. It is not that you will love tomorrow. You can love right now, this very moment; it needs no preparation. It is our intrinsic capacity, we are born with it -- it is our natural fragrance. We can destroy it, we can create hindrances, obstacles, but we cannot produce it. We can only remove the hindrances and then it starts flowing. So this name will become a remembrance to you -- that love is the only growth there is, the only maturity. When a child is born, he receives love. He cannot give it back. He does not know what it is. He is so helpless, he is so dependent. So he learns how to receive love from the mother, from the father, from the family, then from the society. Many people then remain in that childish state. They are always asking for love. That is immature. A man becomes mature when he starts giving love. And when you start giving love, you start growing. If you simply go on asking and asking and asking.... And everybody is asking: the husband is asking from the wife, the wife is asking from the husband. Everybody goes on asking, 'Give me love!' and everybody goes on complaining that nobody seems to be loving. The whole world is in tremendous misery because people ask for love and they have completely forgotten that unless somebody gives, it is not going to help. This happens because of the natural situation. The child receives love without giving anything on his own. He simply learns how to receive; he becomes receptive. By and by he completely forgets that love has to be given also. So start giving unconditionally. Even if you are passing by the rock, give love to the rock. It is real energy. If you start sharing it, you will feel that you are becoming fresh and new every moment. It actually happens that when you look at somebody -- maybe a rock, a tree, a person, anybody -- if you look with love, a chunk of energy is thrown from your eyes onto the object of your love. The object of your love receives your juice, and a great process sets in. When you give love to somebody, an emptiness is created in you. That part, that chunk of love that you have shared with somebody, creates an emptiness in you, a void. And in this existence, voids are not possible. Once there is a void, from the whole universe energy flows into you and fulfills that void. So whenever you love somebody, you will feel energy flowing into you from unknown sources. You will feel refreshed, renewed, rejuvenated. A lover is always young -- that is the secret of a lover. If you don't love, there is no need for God to flow into you, for the universe to flow into you. You don't have any space inside; you are a hoarder, a miser, who goes on hoarding the small amount of energy that you have. That energy goes on becoming stale, stagnant; it starts stinking. It becomes hatred, jealousy, possessiveness, anger. It becomes violence, destructiveness. And energy, to remain creative, needs to flow. If it is not flowing, it will become a cancerous thing inside you. People are suffering because they have love to share and they don't know how to share it. They have completely forgotten the language of sharing, and they are afraid that if they share they will be losing something. But the moment you share energy, suddenly from all over the universe, energy starts flowing in you -- you have created a situation. And once you know this secret, then you know that in giving you get, in sharing you become richer. Then you start sharing unconditionally. It is not a question then of whom to share with -- with the trees, with the sky, with the clouds -- you start sharing with everybody. If there is nobody and you are sitting in your room, you share it with the emptiness of the room. But you fill the whole room with energy because you know that this is the only way to renew your own energy and to go on getting it from God. First something has to be done within us. First We have to change and then we will become capable of helping people and changing people. Unless a man changes from within, nothing changes. You can change the social structure, you can change the economic structure, but if the man remains the same nothing is going to change, because man is the basic reality. Things are wrong in the society because something is basically wrong in man -- it is not vice versa. There is so much wrong in the society because so many people are projecting their inner wrong on the society. The society has no soul, only man, the individual man, has a soul. And the real revolution can only happen in the soul. Is it the faults of the Gurus, Sadgurus? That time too the world was in those precarious state - is it not strange? We all are responsible for this world and we all have made it to be so precarious. The real problem remains the same. Of course we agree with much of your post. Love is simply wonderful, giving love, sharing love is the greatest joy. "We all are responsible for this world and we all have made it to be so precarious. The real problem remains the same"
The question is though, if the problem remains the same, and the solution remains the same,i.e.love is the only answer , is anything going to change? Is love alone going to bring about a Golden Age. The world sinks deeper and deeper into degradation. Surely this shows us that love alone is not the complete answer. Non-duality to my understanding is to see the One in the many, to understand that everything is interlinked and intertwined through that spark of divinty in all. Change, again to my understanding, is not brought about from outside but only from inside. It may be commonplace but it is still true that we cannot change others but only ourselves. And once we've begun to change ourselves - like for instance change from a deficit-oriented to an asset-oriented view of life - we will see the responses ... it's like throwing a stone into a calm lake. What else could ever bring about a Golden Age? And did not the ancient Greeks allude to that same fact when they called their science philosophy? Philos being the ancient Greek word for love and sophia being the ancient Greek word for wisdom. Usually the disciple thinks -- and has been made to think for centuries -- that the master gives his wisdom to him. That is absolutely untrue. The master simply takes away all that you think wisdom but which is not wisdom, only borrowed knowledge. .. it looks like wisdom but is phony, because it is not rooted in your experience. The true master, or the true wise man, takes away all that is false in you -- and your wisdom is false, your knowledge is false. You know nothing of life, you know nothing of God; all that you know are mere words without any content, hollow, rotten, but just because they have been handed to you by your parents, by your teachers, by your priests, you have been preserving them as if they are great treasures. In fact, they are the burdens that don't allow you to fly in freedom in the open sky of existence. The master takes away everything that is false in you -- and what is not false in you? Your whole personality is given by the society. You came into the world innocent, full of wonder, knowing nothing but longing to know everything. The society has filled your minds with all kinds of knowledge. And one thing has to be remembered here: Knowledge is significant when it grows within you; it becomes poisonous and dangerous and murderous when it is forced upon you. All that you know -- have a look at it. Has it grown within you? Or has it been forced upon you? Is it a conditioning from the outside, or just an overflowing of your own being, of your own spring of life? You don't know anything about your own being. Hence the true wise man takes away all your wisdom and leaves you again in the same space as you were born -- in wonder, knowing nothing. That's why a true master is going to be condemned by the whole world, for the simple reason that he does not give anything to you -- on the contrary, he goes on taking things away from you. He leaves you utterly naked, in a state of innocence like a child. The function of the master is to help you unlearn everything so that you become again an innocent child. Only from there your real growth starts. Only from there is the true beginning. From there, your authentic journey can start. Experiences show that intellectual endeavors, howsoever potent and mighty they may seem, have not catapulted or thrown or raised any human being to spiritual heights. History shows that the highest spiritual masters are those who were uneducated in formal sense. 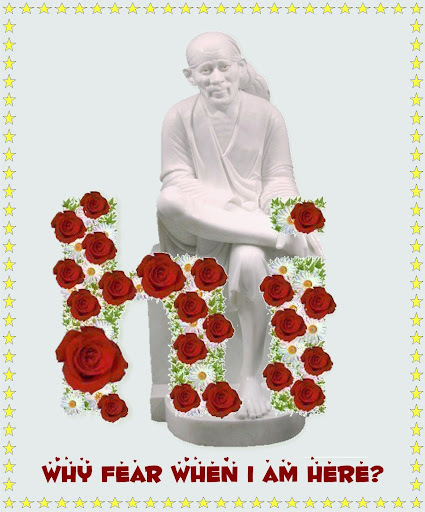 For example, Ramkrishna Paramhans, Shri Shirdi Sai, Namdev, Tukaram, Paltu Maharaj etc. It obviously means that there is something self-limited in the intellectualism in the path of spiritual progress. All that the spiritual masters learnt in their life and spread among others is 'Bhakti' or devotion. "Bhakti" means love of God. Since God is not sitting in a throne like an individual, therefore, how to love Him. The answer is that God is in everyone and if one has the capacity to love others, he is doing real devotion. Even doing all the worship, yoga, pranaayaam (breath control) etc., for one's own improvement is not 'Bhakti'. It is one activity for fulfilling spiritual/occult ambition like any other ambition. People in the path of devotion develop certain qualities that manifest in their daily life activities. They become humble, sacrificing, more universal and sensitive to the pain of others. They love Baba and flow in that stream unknowingly carrying along with them all that come in their contact. They don't try to pray to Baba for the fulfillment of any material requirements. Baba has a role to play to lead them ultimately to the correct path and correct goal. They have nothing to prove and, therefore, do not allow 'ego' to assert itself. This is the correct path towards Baba. Subhadra dear very very true. This is it! Without a Guru we are in utter darkness. The reality remains a mere miasma and a mirage. The glamour of the world is so great and overbearing that passing phantoms appear stable and substantial, the untrue puts on the mantle of Truth, and we cannot possibly tear aside the magic veil and escape from the false charm in which we are enveloped. It is the Master's Grace that can pull a spirit out of the physical sheath right above the plane of senses. A jiva is always in stark darkness. If he closes his eyes, there is darkness within. Again, he is enveloped in total ignorance. He who can dispel this darkness of jivas is called a Guru. The term Guru consists of two words: Gu meaning darkness and Ru meaning Light. Hence Guru means one who can lead us from darkness to Light, from untruth to Truth, and from death to immortality. The nails of the Guru's feet shine like a crest jewel in the head of a toad that shines forth like a flashlight in darkness. To succeed on "Spiritual Path", we must find One who has explored it to its utmost limits. A Living Master is an indispensable need, and an indispensable means to the attaining of Self-Realisation. On the purely physical level, He serves as a living example of a Perfect Life. He tells us of our True Home and the way that leads to it. On the spiritual side He gives us details of the inner Path, its intricacies and difficulties, provides His Attention with an actual experience of withdrawal from the body and of the inner Light and Sound, and guides us through the more difficult part of our inner journey until we reach our Goal. "The function of mind is to think, it cannot remain for a minute without thinking. If you give it a sense object, it will think about it. If you give it Guru, it will think about Guru. ".